But my taste for customizing cars isn’t strictly cosmetic. I’ve been through all of the performance upgrades as well. My main interest is getting cold air into the engine faster—it’s denser and leads to better performance, as well as getting exhaust out of the engine as quickly as possible. Well designed “cold air” kits solve the former, and the science of exhaust kits fix the latter. The latter is actually more fun, because the sound of a perfectly tuned exhaust is genius. With the cult of the car in full effect in LA, there are plenty of choices. Pepe who runs AAA Exhaust on the corner of La Cienega and Venice Blvd is always a great spot to see great work. They aren’t afraid to handcraft beautiful “Cat Back” stainless systems, and their selection of stainless tips is unmatched. I’ve had more cars than I can remember tinkered with by Pepe and Co.
My 1948 Mercury Woodie has been an ongoing project for the last 15 years. The Woodie is really beautiful, and if you haven’t been in a wooden wagon on a summer night, you need to. I’m especially lucky because the wood on my Merc is all original, and has never been apart—which means no rattles. Aside from wood refinishing 30 years ago, it’s a full restoration that looks bone stock. A great advantage is it has been upgraded to modern running gear—350 Chevy motor, automatic trans, power steering, disc brakes. Although it looks showroom original, you could drive it cross country without a worry. What the Woodie was missing was a killer exhaust to complement the Edelbrock intake and Holley 650 carburetor. 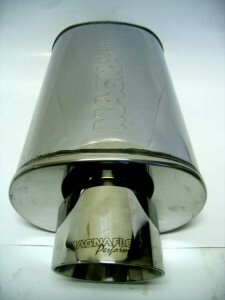 Through a friend I was introduced to the tech center team at Magnaflow mufflers in Rancho Santa Margarita. Led by Gabe Hall, the team at Magnaflow has performed their magic for many of So Cal’s best hot rod builders. Magnaflow offered to build a custom set up for the Woodie, and a week after dropping her off, I couldn’t wait to turn the key. The sound was fantastic, with performance to match. Cruising at 85 on the 405 back to the South Bay was a dream—she sounds perfect. Magnaflow has designed and stocks a cat back system for the Defender 90/110’s and the word on the Defender forums is that the sound and performance is outstanding. I’m currently running a stock exhaust system with a Flowmaster chamber muffler that could use an upgrade. Tweaking and wrenching on cars in the summer is a ritual, and a time honored tradition in my family. Together we’ve messed with 1930’s Dodges, too many Mustangs, F100’s and Indian motorcycles. While maintenance is mandatory, it’s the great sounding performance stuff that is heart of it all. a record player in the car? Show everyone pictures of the woodie! A picture is worth a million words!!! » South Bay Bodysurfing–Obama Would Go!